Prior to 2011, I had not been up a mountain, at least not in living memory. But since moving to Switzerland I’ve been captivated by the Alps, Europe’s greatest mountain range. 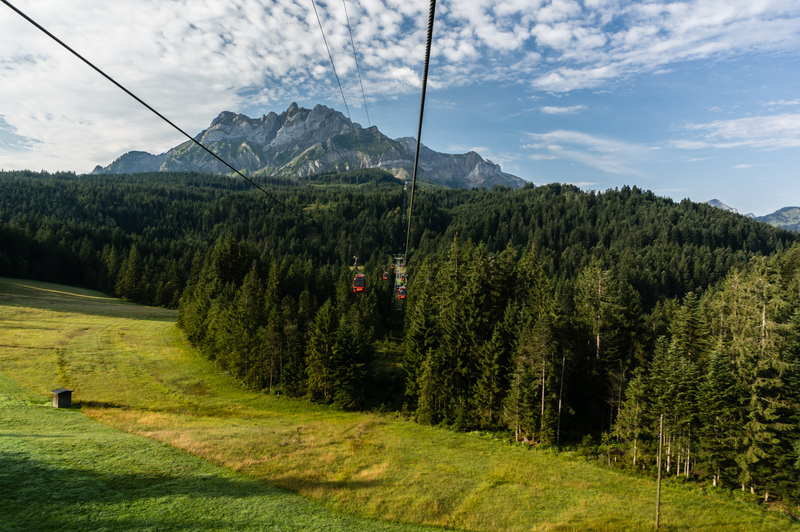 I could try one of the 10 best mountain rides in Switzerland or make the trek on foot. Having an insatiable hunger to experience its great peaks on foot, I set out to find Switzerland’s most compelling vistas, with three summits in particular coming to the fore. You’d only have to speak to my partner Emma to find out how obsessed I had become with seeing these incredible views with my own eyes. None of the experiences could be considered cheap, and all involved a lengthy journey both to the destination and in the mountain ascent. But I strongly believe in making the most of wherever you’re living, you never know when life might take you somewhere different. I wanted to make sure I had no regrets whenever the time came for us to leave Switzerland. The three summits were probably just about doable as long day trips, but I didn’t think that would give them the time that they deserved. I wanted to savour the experience of being on top of the world. So over the last year as the opportunities came up, we’ve taken a day or two off work and made a long weekend of each location. This meant that we gave ourselves the maximum chance of good weather, and had more time to enjoy being in the mountains. 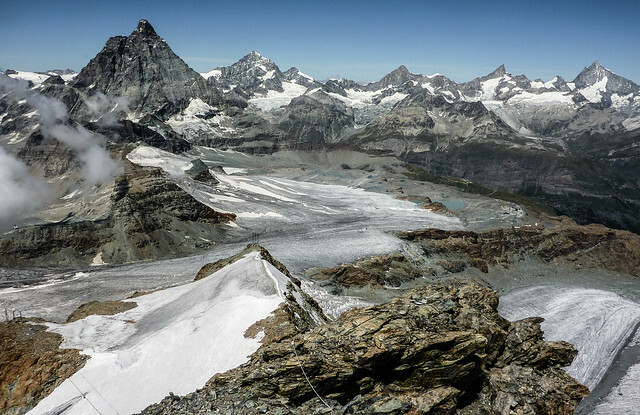 Matterhorn, Klein Matterhorn, Switzerland a photo by Flights. Camera. Satisfaction. on Flickr. Rising high above the Swiss mountain town of Zermatt, the Matterhorn’s distinctive shape makes it one of the most famous peaks in the world. Accessible by gondola and aerial cableway from Zermatt you can reach the summit of the Klein Matterhorn – its shorter cousin – for some unbeatable views of the surrounding Alps. What made this one special? It was our first visit to the Swiss Alps and the start of a fantastic road trip over some of the best mountain passes in the world. What more can you ask for?! Aletsch Glacier, Jungfraujoch, Switzerland a photo by Flights. Camera. Satisfaction. on Flickr. Perhaps upstaged by its famous neighbour the Eiger, the Jungfrau sits among what I consider to be the most stunning alpine area of Switzerland – the Bernese Oberland. The epic journey to the summit is what makes this trip a marvel. Two and a half hours on multiple trains from the town of Interlaken, through Grindelwald and Kleine Scheidegg before reaching the final push to the summit – the Jungfraubahn, a train that passes 7km through a tunnel forged into the mountains between 1896 and 1912. The views of the Aletsch glacier, the largest glacier in the the Alps, are simply sublime. Tomlishorn Summit, Mount Pilatus a photo by Flights. Camera. Satisfaction. on Flickr. 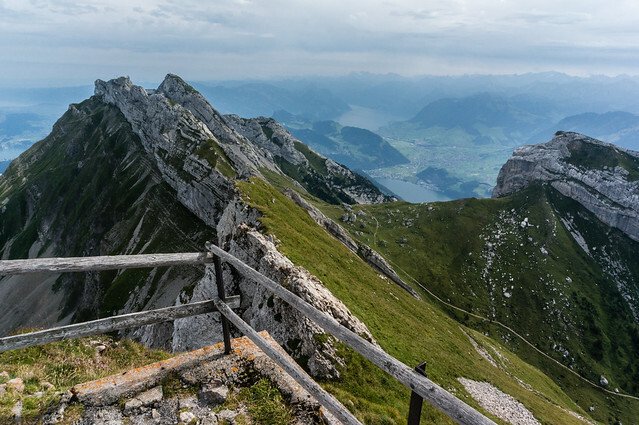 Famed for dragon myths dating back to medieval times, Mount Pilatus has a mysterious quality that I didn’t feel at the Matterhorn or the Jungfraujoch. Rising high above Lucerne and its beautiful namesake lake, the summit offers incredible views of what must be one of the most unique landscapes in the Alps. Because it stands alone and is higher than all of the surrounding area you really get a fantastic unobstructed view in every direction. It’s unusual to be looking at mountains from above. I am yet to see another mountain panorama so easy on the eyes. 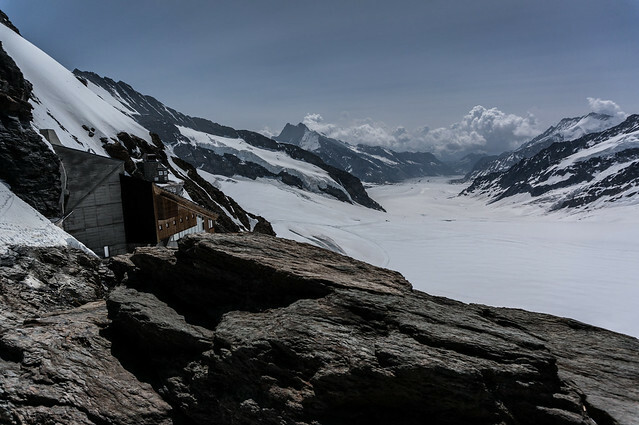 Switzerland is filled with extreme luxury like Tempston Luxury chalets, extreme natural beauty like the captivating Alps, and extreme adventure like summiting Switzerland’s highest peaks. Whatever experience you’re after in Switzerland, go for it! I’ve learnt that there is no time like the present to get out and explore what your country has to offer. Life has a strange way of surprising you with a change of direction when you least expect it. What are the things you love about where you’re living right now? Do you have an idea what you want to see and accomplish in the time you’re there? If you’ve been putting off that weekend away for the last few months, it’s time to take the plunge and go for it. Take control and see the world! About the author: Flights booked. Camera packed. Satisfaction guaranteed. Ben is a British expat currently living in Geneva, Switzerland. He works full time as a software developer, but his full time passion is exploring our incredible planet and inspiring others to do the same through his photography. To find out more visit Flights. Camera. Satisfaction. I agree with your ‘seize the day’ attitude! What a great goal to be ‘obsessed’ with. 🙂 I am amazed that mountains all over the world can look so different, and still so beautiful. What’s your next goal in Switzerland? They are incredible, I know some people think that once you’ve seen one view you’ve seen them all. But I think these shots demonstrate just how diverse mountain landscapes can be. And all in the same country no less! What’s next? Great question! I’d really like to see more of the Bernese Alps, so I think hitting the summit of the Schilthorn would be great, and a nice gentle hike to Lake Bachalpsee from Grindelwald First. I’d also like to get out to St Moritz and the Engadin valley, it just looks stunning. Unfortunately that is much further from me in Geneva, so it will need a little more forward planning! Incredible photos. This was a post that made me want to try it myself. Well done. That’s great, thanks! If you ever have the chance to explore Switzerland you’ll be rewarded with incredible natural beauty everywhere you turn. It’s a fantastic country.